If a window claiming that “your files have been encrypted” has been opened for you, it is very likely that a ransomware infection Cyber Splitter Vbs Ransomware has secretly entered your computer. The main goal, as you have probably understood, of this ransomware infection is to extort money from users. The sample our researchers tested did not encrypt any files; however, a new version encrypting files might be released, so you might also notice that your files are really encrypted, and you cannot access any of them. No matter your documents, pictures, music files, videos, etc. are encrypted or not, you have to remove Cyber Splitter Vbs Ransomware as soon as possible because this computer infection might strike again. Fortunately, this threat works from the place it has been launched. In addition, it does not lock the screen and system utilities, e.g. Task Manager and Registry Editor. Therefore, it should not be hard for you to erase it. Of course, we still suggest that you read this article before you take action. Cyber Splitter Vbs Ransomware will open the window on your Desktop the second it enters the computer. 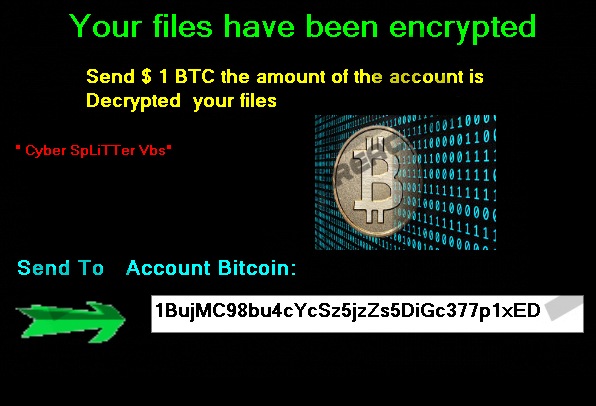 The message you find there says that all the files have been encrypted, and now you have to pay the ransom of 1 Bitcoin (1 BTC is approximately $600). If your files have not been locked, you, probably, understand that there is no point in transferring money to cyber criminals. Actually, in the opinion of researchers, you should not make a payment even though you have really found your all personal files encrypted too because nobody knows whether these files will be unlocked for you. In most cases, cyber criminals take money from users but do not give the decryptor/decryption key for them. It some cases, cyber criminals do not know the decryption key either. Have you found that your music, pictures, videos, documents, and other important files are encrypted? If so, you should, first of all, delete Cyber Splitter Vbs Ransomware from your computer so that it could not encrypt your files again and the tool you are going to use. Then, we suggest that you download several decryptors/file recovery tools from the web and try them out. Some users manage to get some of their files back using a free tool but, of course, we cannot promise that this will work for you. If the free tool has not helped you to unlock files, you should wait for the decryptor to be released. What else you can do is to recover your files from a backup. Of course, it is not a solution for you if you do not have copies of your files anywhere. Even though Cyber Splitter Vbs Ransomware is quite a simple threat that does not do anything much, there are much more dangerous ransomware infections out there that encrypt files, lock screens, and does not allow people to use their computers normally. Of course, they also seek to extort money from users. Research carried out by specialists at pcthreat.com has shown that such infections are mainly distributed via spam emails. The executable files of these threats are put in spam email attachments and immediately appear on the computer if users open/download the attachment. These emails with a malicious attachment are made to look harmless so that more users will open them and infect their PCs. Cyber Splitter Vbs Ransomware is also distributed in spam emails, so if you remember opening an attachment from a spam email recently, it is not surprising why you have encountered Cyber Splitter Vbs Ransomware. Of course, ransomware is not only spread via spam emails, but might enter computers via fake updates and exploit kits, so you need to be always cautious and attentive or simply install a security tool. You need to remove Cyber Splitter Vbs Ransomware no matter your files are locked or not. In case they are encrypted, you should not expect to gain access to them by deleting this infection from the system. Of course, you still need to get rid of this threat as soon as possible. Luckily, you will delete this threat fully if you find and erase its .exe file. This file has a random name, so not all the users manage to find it themselves. If you are one of them, use an automatic antimalware tool, such as SpyHunter. Cyber Splitter Vbs Ransomware will be gone in the blink of an eye when you launch the scanner. Find the malicious file of the ransomware (check the Downloads folder). Quick & tested solution for Cyber Splitter Vbs Ransomware removal.